Upgrade/overhaul your old aircraft tug! Change-Over/Update to the latest Model 40EZ!!! See below for details. As a service to our past customers, Northwest Manufacturing offers a path to refurbish old gas-powered Model 35 and Model 40 aircraft tugs. The kit comes partially assembled for ease of use. 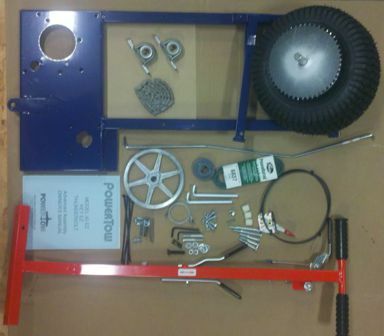 Simply remove the engine and transmission from your old airplane tug and install on the brand-new kit. The Changeover Kit allows customers to have the latest technology available at a fraction of the cost of a new aircraft tow. These updates offer the safety and beauty of a new Powertow at a low cost for our customers.